Rattle Battle is the fourteenth level of Donkey Kong Country 2: Diddy's Kong Quest. It is also the fourth area of Krem Quay. 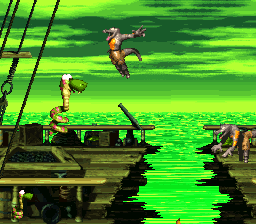 The level takes place on the deck of Glimmer's Galleon. The Kongs discover an Animal Barrel here containing Rattly the Rattlesnake, who must be played as throughout almost the whole level. Rattly's jumping skills prove useful here, as they are required to cross large pits and to reach highly-placed items. Kannons, Zingers and Flitters can be found here, as well as Kaboings, who populate much of the stage. As with most ship levels, there are several large barrels across the level that the heroes can climb on top of. Rattly makes his way to the ship deck. 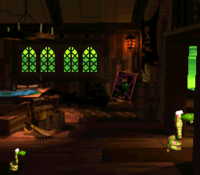 The level begins on a ship deck under a hidden Auto Fire Barrel that can shoot the heroes into the air and onto a high section of the ship that contains a Banana Coin, a Banana Bunch, and a Bonus Barrel. Across from the level's start, there is an entryway that leads into part of the ship. Here, the Kongs can find an Animal Barrel with a trio of bananas under it. If they enter the barrel, they turn into Rattly, who must proceed by heading through the nearby entryway on the end of the room. After traveling through the opening, the rattlesnake finds himself outside on the ship deck again. Above him, there is a DK Barrel with a few bananas around it. A pile of two large barrels is also ahead, but a Kaboing bounces in front of it. If Rattly reaches the top of these barrels, he can collect the letter K that is placed on top of them. 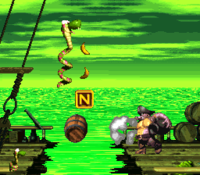 After passing some bananas that float in the air, Rattly makes his way up a small stairway and to a pair of Kaboings that jump in front of a large barrel. He can use this barrel to help him cross a small pit nearby. On the other side of this pit, there is another Kaboing and a lone Banana Bunch. A pit is also ahead of here with a Flitter flying above it. The enemy can be bounced on to help the rattlesnake cross the pit, even though Rattly's jumping abilities can also allow him to cross the pit with a single jump. A trio of Kaboings bounce in the area ahead of here, and they are followed by a Zinger above a large barrel. 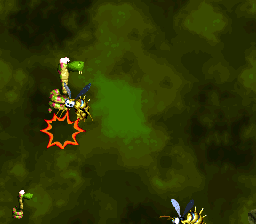 The Zinger flies in front of a Banana Coin, so Rattly must defeat the foe in order to grab the item safely. The rattlesnake can find another DK Barrel ahead of here, along with some more Kaboings and some large barrels that he can use to help him cross an additional pit. Although he can cross this pit with his jumping ability alone, a Zinger is also above the abyss, and it can be bounced on to help him cross. Once the pit is crossed, Rattly approaches some Kaboings, two of which that bounce on the edges of a small gap. The Animal Friend is able to jump into this gap without falling in the water, as ground is at bottom of the gap. From the inside of this gap, he can head to the left to find a Bonus Barrel, or he can travel right to discover an Auto Fire Barrel that immediately shoots him back onto the top of the ship deck when entered. A pit is farther ahead of here, and it is noticeably wider than the previous ones in the level. Two Zingers float in the pit, and one of them circles the letter O. Once Rattly crosses the pit, either by bouncing over it or by bouncing on the Zingers to cross, he approaches a Kaboing and a small stairway leading downwards. Some more Kaboings are after here, and they bounce on top of a large pile of barrels with a Zinger flying in front of it. The level's DK Coin hides in an area inside the ship, which is placed to the right of the Zinger. The large barrel pile is followed by a small pit, and once the pit it crossed, Rattly can find the level's Star Barrel. Rattly crosses the pit with the letter N above it. The Star Barrel is followed by two small ledges with a DK Barrel and some bananas around them. A pile of six large barrels is after the ledges, and a Kannon with a Banana Coin behind it stands on it. Once the rattlesnake passes a few bananas located after this foe, he reaches a small pit with a Zinger above it. If he manages to cross this pit, he can find some more bananas and a Kaboing that bounces in front of a few large barrels. A Golden Feather, found only in the Game Boy Advance version of the game, is placed on top of these barrels. The letter N and some bananas float above a pit placed nearby. A Kannon shoots barrels over this pit, which must be crossed to progress to an additional pit with a Zinger above it. On the other side of this abyss, Rattly can find a large barrel with an arrow, formed by bananas, above it. The arrow points upwards, where a Bonus Barrel is hidden. A DK Barrel is ahead of here, being followed by some larger barrels that Kaboings bounce on. Once these foes and the barrels are passed, the rattlesnake makes his way down a small stairway and towards a pit with a Zinger above it. The only way to cross this pit is by first bouncing off of the Zinger and then landing on the other side of the pit, where a kannonball-shooting Kannon stands. Another Kannon is located on top of some large barrels piled nearby, and it shoots kannonballs downwards. There is a small abyss farther ahead of this foe, and a Zinger flies above it. If this pit is successfully crossed, Rattly makes his way towards a large pile of barrels with many Kaboings on them. In the Game Boy Advance version of the game, one of these Kaboings sports a camera icon above its head, indicating that it is in possession of a photograph. The letter G is also on the barrel pile, which is followed by a pit that can only be crossed by bouncing off of the barrels shot by a Kannon on the other side of it. Once this pit is crossed, the rattlesnake makes his way down a small stairway with a Kaboing near it. On the bottom of the stairs, there is a Kannon, who stands on top of a pile of barrels and shoots kannonballs on the ground below it. After Rattly passes another pile of two barrels and heads up a small stairway, he comes up to a No Animal Sign. When this is passed, he turns back into the Kongs, who are given a Banana Bunch as a prize. An End of Level Target is located just ahead of here, and if it is jumped on, the level is completed. A Dixie Barrel is positioned above this target, and if the heroes shoot to the target with this barrel, they win a prize from the target, such as a red Extra Life Balloon. A DK Barrel is also hidden to the right of the target, and it is able to give the player Dixie Kong if they need her to enter the Dixie Barrel. 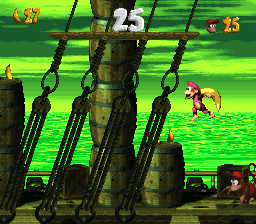 At the start of the level, the Kongs must jump straight upwards to land in a hidden Auto Fire Barrel that shoots them onto a higher part of the ship, where there is a Banana Coin, a Banana Bunch, and a Bonus Barrel. To reach the Bonus Barrel, they must use their Team-up move to throw one another into it. The barrel leads them to a Bonus Level, where they must use many large barrels as platforms in order to reach a Kremkoin that is placed at the top of that area. They have 25 seconds to collect the coin. Almost immediately before the letter O, Rattly discovers a pair of Kaboings bouncing around a small gap in the ship. He needs to drop down into the gap, as directed by a small trail of bananas, and then travel west into the lower part of the ship. A Bonus Barrel is hidden here, and it leads to a Bonus Level, where Rattly has 10 seconds to find and collect a Kremkoin. To reach the coin, he must first cross a wide gap in a rigging-themed area. He can cross this gap by bouncing on the many Zingers that fly above it. Immediately before reaching the final DK Barrel in the level, Rattly finds a barrel with an arrow (formed by bananas) pointing up above it. The rattlesnake needs to get on this barrel and use his special jumping ability to leap high into the air, where he can land in a hidden Bonus Barrel that leads to a Bonus Level. 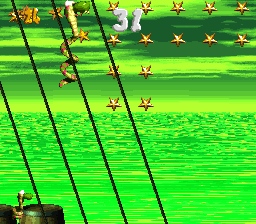 In this special stage, the snake must bounce on piles of barrels to collect 75 stars scattered throughout the air. If he grabs all of the stars within 40 seconds, a Kremkoin appears on top of one of the barrels. The letter K is above a pile of two barrels found immediately after the first DK Barrel. In an area located near the Star Barrel, Rattly can find a pit with a pair of Zingers above it. The letter O is above them. Shortly after Rattly passes the Star Barrel, he reaches a pit with the letter N above it and a Kannon next to it. He can bounce on the barrels shot by this enemy to reach the letter safely. The letter "G" is on the highest point of a large pile of barrels found shortly before the end of the level. DK Coin Immediately before reaching the Star Barrel, Rattly should notice several barrels piled up on each other, which are bounced on by Kaboings. If he approaches the small pit following these barrels and then jumps into the side of the ship, he can reach a hidden DK Coin and then land in an Auto Fire Barrel that can shoot him back onto the top of the ship. In the Super Nintendo Entertainment System version of the game, a banana is next to the coin to give the player a hint of the coin's location, but in the Game Boy Advance version, there is no banana. Golden Feather (GBA version) After Rattly passes the Star Barrel, he discovers the first Kannon in the level. He must pass the foe and jump across a large abyss nearby, which he can spot a group of two large barrels on the other side of. He can jump to the top of these barrels to find a Golden Feather. Photograph (GBA version) Immediately before the letter G, Rattly makes his way to a large pile of barrels that many Kaboings bounce on. One of these Kaboings has a camera above its head. If Rattly or the Kongs defeat this enemy, then the photograph and earn a picture of a Kaboing for the second page of their scrapbook. Rattly jumps above a barrel. Rattly begins the level in the Game Boy Advance version. An arrangement of the background music for this level appears as a track in Super Smash Bros. Ultimate.